On Saturday, March 23, 2019, we will host another walking history tour through Bloomingdale and around the perimeter of McMillan Park. Once again, we are fortunate to have our neighbor and friend Paul Cerruti leading the tour. Paul has compiled a tremendous amount of detailed information about the park and its role in our neighborhood through the years since it was first opened to the public. The event will cover a lot of the information presented in the history walks that we hosted in 2017 and 2018 that were very well attended and enjoyed! The weather we hope will be ideal for such a walking tour. This is our first tour of 2019. We plan to have about four tours per year although we have yet to set dates for subsequent tours. Space still available for March 23rd! The tour will showcase McMillan Park, its vistas, unique history, and connection to historic landmarks in the Bloomingdale neighborhood. The first part of the walk will include information and bonus highlights about the history and development of Bloomingdale, much of it in anticipation of the opening of McMillan Park. The tour will last about two to three hours and will start at the triangular park located opposite the Big Bear Café (corner of 1st Street & R Street NW) on Saturday, March 23rd at 9:00am (rain date Sunday March 24th, 9:00am). Light liquid refreshments will be served and a selection of some of our favorite mounted art photos of McMillan Park will be offered for sale at the end of the tour, as well as some lovely greeting cards of those same photos! Please register for the event by sending an email to restoremcmillan@gmail.com or by calling Kirby at 202-213-2690. We are limiting the tour to 30 people or so to ensure that all who attend can hear easily and participate fully. So please register early to guarantee that you’ll be able to be part of this special day. Kindly note that the event has a suggested donation of $20 in advance ($25 on the day of the event) to benefit Friends of McMillan Park’s efforts to save this registered national historic landmark from demolition. We greatly appreciate your support. Even if you are unable to join the tour, please consider making a donation to help support these efforts. You can donate via PayPal (see the “Buy Now” button on www.friendsofmcmillan.org/merchandise), contribute to our Crowdrise campaign (www.crowdrise.com/savemcmillanpark), or pay in person with cash or credit card with FOMP’s Square account on the day of the event. Thank you in advance for your generous contributions! 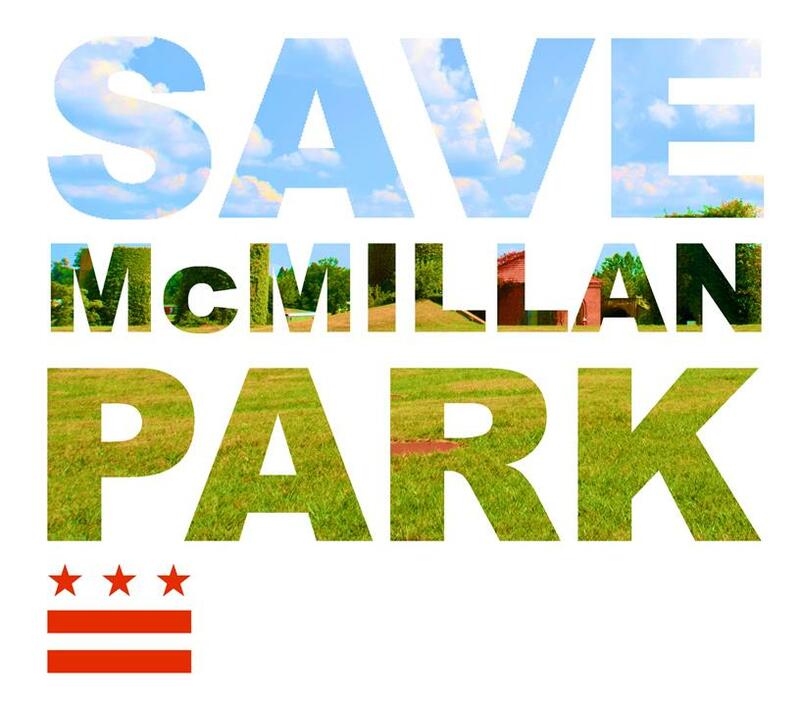 Friends of McMillan Park returned to the D.C. Court of Appeals on January 22nd to present oral arguments challenging the District’s proposed demolition of the site. Now we anxiously await the court’s decision, both for that most recent hearing and another hearing held on October 17, 2018, which of course we hope will be in McMillan Park’s favor. We have no idea when the court’s decision will come out, or if the court will decide to combine both the zoning appeal and the historic preservation appeal into one decision. Friends of McMillan Park is now a part of the Amazon Smile program, allowing you to directly and automatically donate to the Friends of McMillan Park when you shop on Amazon.com. See this link for more information: https://smile.amazon.com/ch/46-0977224. If you have any questions, please contact restoremcmillan@gmail.com or call 202-213-2690.